One reason why I’ve tended to stay out of the rumors and predictions business for some time now is that those became turbulent waters. Made much more turbulent by what’s happening with the collapse of camera sales. Last month in a Q&A I wrote that I was sure that the D300s replacement was coming. That was based upon conversations with people, who as the mainstream press would report it, wished to remain unidentified as they weren’t authorized to talk about the subject. After additional conversations in the last couple of weeks with a few key contacts and some supporting information that’s coming in from other sources, I’m going to back off what I wrote about the D300s replacement. It may be coming, it may not be. All I can say with certainty at the moment is that it was being worked on. Why the backtrack? Because suddenly the only upcoming camera that anyone in Nikon will talk about on or off the record is the D5. The only camera. Within the last month pretty much everyone at Nikon I know has suddenly gone silent about anything else that might be in the pipeline. The sense I get is that top management is forcing an unplanned, short term re-evaluation of everything in the Imaging business, and no one knows how it will resolve. The only other reasonable conclusion would be that the already secretive Nikon just decided to advance to the North Korean level of reclusive and secretive, and is now digging bunkers into the Tokyo landscape. Mirrorless remains behind where it was last year (91.6%), as do DSLRs (93.4%). 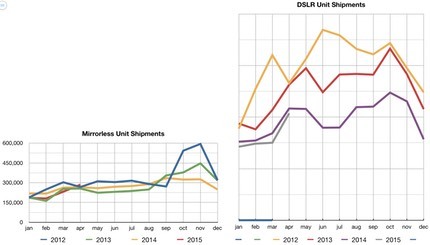 In the supposed mirroreless-crazy Japan, mirrorless shipments dropped to 78.7% of last years’ units (though that’s distorted a bit by the way the companies stuffed the channel prior to the sales tax increase). Note that everyone has instant rebates and special offers in place at the moment, too. It’s a great time to buy a camera if you need one. It’s not a great time to introduce new cameras with marginally better performance and features when you’ve got plenty of inventory of past models still sitting on shelves. Sony used NPD retail sales data in the US to blast out a press release last week trumpeting just how good their US sales numbers are (see Steve Huff’s site, for an example of how it was picked up by some Internet photography sites). Meanwhile, in Tokyo, Sony quietly admitted that their market share in interchangeable lens cameras (mirrorless and DSLRs) was 11% last year (compared to Nikon’s claimed 34% and Canon’s >40%). I don’t know where Nikon’s apparent sudden re-evaluation is going to lead them. I see only three scenarios that make any sense: (1) pull back from the weaker consumer market and contract; (2) continue to iterate as usual and contract; or (3) re-invent the camera and hope to grow. I don’t think Nikon (or anyone else) is close to #3 at the moment. Thus, you pretty much still have to pick between #1 and #2 short term and try to guess which contraction is less painful. For Nikon, that’s dangerous territory, as two-thirds of their sales and essentially all of their profits come from cameras at the moment. What I see Tokyo trying to do is micro manage any contraction towards minimization. Good luck with that. The market is speaking, and speaking strongly. Finesse isn’t going to work at changing that. Personally, I’m disturbed by the fact that Nikon is repeating mistakes in Imaging that they made in Precision (semiconductor equipment), which means that their problems are systemic and internal. Thus, management re-evaluation isn’t likely to really solve the problem. So, if anyone at Nikon corporate is reading this: just release the D300s replacement. You’ve got a narrow window that’s closing where you can get meaningful revenue from that product. Let the window close and your decision will be made for you.